A terrific horror movie in the vein of The Witch, It Follows and Babadook. A tense vibe throughout with writer/director Ari Aster focusing on mood, atmosphere and music to ratchet up the suspense and horror, and coupled with a phenomenal performance from Toni Collette and the two younger stars: the surprisingly emotional Alex Wolff and creepily innocent Milly Shapiro. Also, pleasantly, the story progressed unexpectedly with some really good unpredictable turns. Sure, the story itself per se was not the most original. It shared DNA with Rosemary's Baby and The Witch, but the execution was refreshing. The film ran for 127 minutes, and it easily felt like only 90 had past by the time the credits rolled. And then we have Collette. She. Owned. It. Her character's evolution throughout the film was superb, and boy did her face ever get a workout. She carried the film and sold it for all its emotional toll and fear factor. Ann Dowd shone in her minor role, but she always does. Although her character was easily the weakest of the main cast. Gabriel Byrne rounded out the cast and he had the unfortunate task of being the token skeptic which was written as is with minimal surprise or nuance. 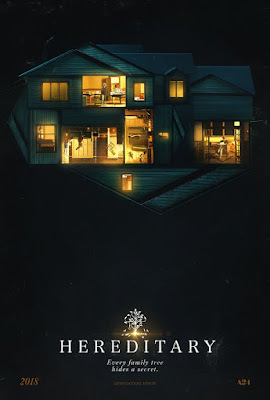 Hereditary was easily one of the best films of the 2018 thus far. But, unlike Get Out, I doubt it will be remembered much come awards time, although Collete truly does deserve some love.